Pura Vida Beach & Dive Resort Cabilao -- Home to a very healthy and diverse marine life, Cabilao is a triangular shaped island west of the main island of Bohol, and facing towards Cebu. Nestled on this beautiful island, Pura Vida Resort is a haven for scuba divers. Bohol is in the center of the coral triangle, a global mecca of marine biodiversity containing 76% of the world's coral species, six of the world's seven marine turtle species, and over 2,000 reef fish species. Amun Ini Beach Resort & Spa -- The name "Amun ini" means "this is ours" in the Ilonggo dialect. 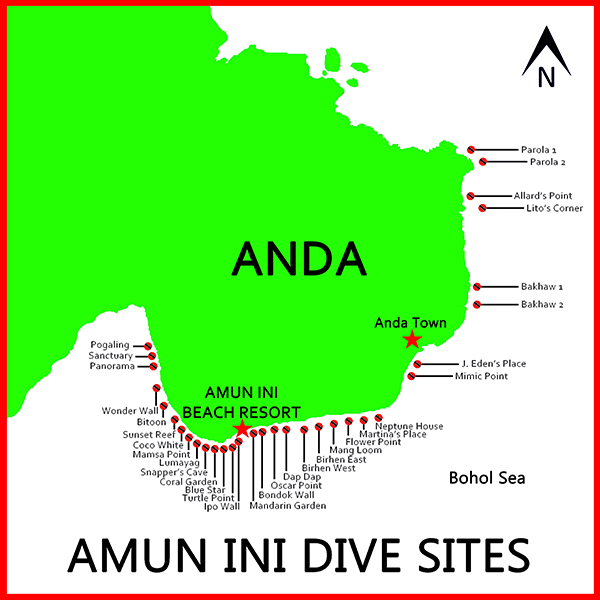 Catering to scuba divers, the resort has a good camera room, trained guides, and more than 33 dive sites ranging from wall diving with large schools of fish to critters such as pygmy sea horse, thorny seahorses, endless nudibranchs, shrimps, crabs, blue-ring octopus, mimic octopus, wunderpus, mandarin fish and more. Amun Ini provides you a fantastic view of a crystal clear blue sea, 15 kilometers of coral reef to explore, and an unforgettable island experience. Transfer Day Touring -- Following breakfast, guests will transfer by boat and car to Amun Ini Resort. Along the way enjoy a tour to the Chocolate Hills region, including exploring a hanging bridge, an exhilarating zipline tour, and a delightful stop to commune with the tiny Tarsiers. Activities are included in the tour price, and are subject to weather conditions and the guests' desires. Lodging rooms at both resorts are comfortably air-conditioned. Air travel to Tabilaran, Philippines (airport code TAG) is not included in these prices. Island Dreams will be glad to assist you in finding the best routing and airfare. Arrange your own air travel or contact Island Dreams for assistance. ** Passport and Travel Requirements: Your passport must remain valid for at least six months following your planned departure from the Philippines. You must have at least one fully blank visa page in your passport. Prices are per person, based on occupancy indicated. Prices, schedules and itinerary inclusions are subject to change. Airfare to Tagbilaran is not included in this pricing. Call Island Dreams for fares. 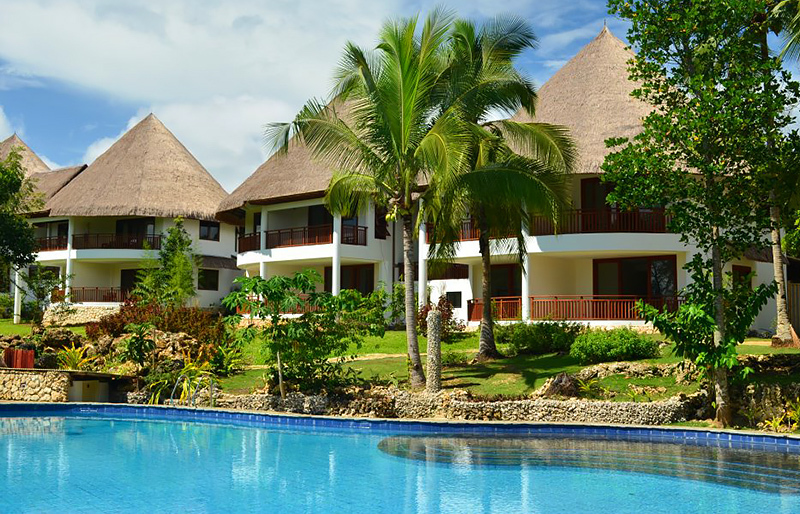 This package price includes ten nights of lodging and scuba diving in Bohol, Philippines. The cost of any other pre or post-trip lodging is not included in the package and is at guest's additional expense. Wednesday, Wednesday, May 13, 2020 -- Depart the USA and fly to Tagbilaran, Philippines (TAG), arriving on Friday, May 15. **Airfare is not included in the basic package price, but Island Dreams stands ready to assist you with air travel arrangements. Departure dates and flight schedules can vary widely due to your choice of air carrier. Friday, May 15 -- Regardless of flight itinerary, all group participants must be arrive Tagbilaran on this date. You will be met at the airport on arrival, and transferred directly to Pura Vida Cabilao Resort. 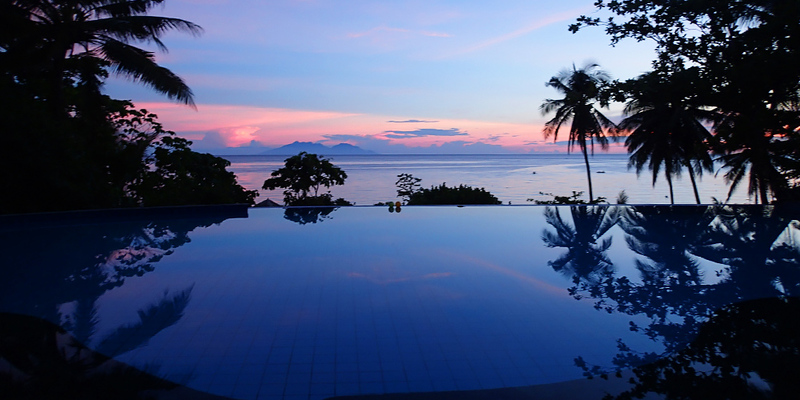 May 15-19 -- Four nights at Pura Vida Cabilao with three meals daily and nine boat dives. Tuesday, May 19 -- Following breakfast, transfer by boat and car to Amun Ini Resort. Along the way enjoy a tour to the Chocolate Hills region, including exploring a hanging bridge, an exhilarating zipline tour, and a delightful stop to commune with the Tarsier monkeys. Activities are subject to weather. May 19-25 -- Six nights at Amun Ini Resort with three meals daily, 16 boat dives, free internet, and use of stand up paddle boards and kayaks. Monday, May 25 -- Depart Amun Ini and transfer to Taglibaran Airport for the flights back to USA. Tuesday, May 26, 2020 -- With the International Dateline in your favor, return to the USA, with the day to rest up before returning to your home/work routine. Confirm your place in the fun! -- A deposit of $500 per person will guarantee your spot on this Philippines diving adventure. Full payment is due no later than 90 days prior to initial departure. 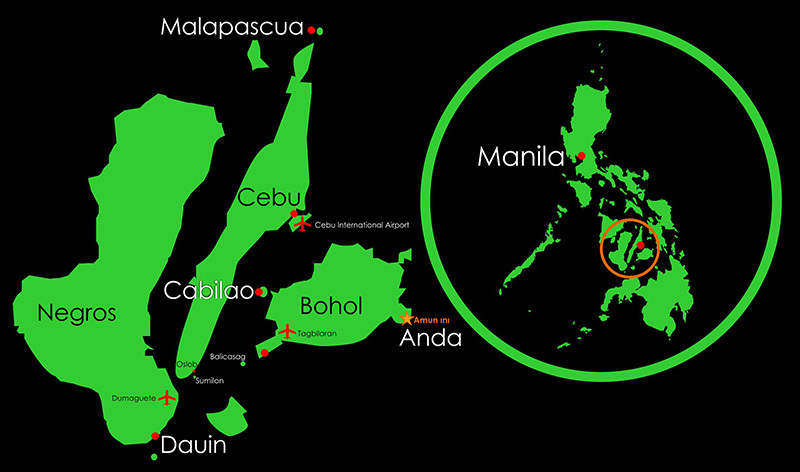 You may book your own air travel to Tagbilaran, or enlist the aid of the dive travel experts at Island Dreams. Simply phone or email us for complete details. Contact Tina at Island Dreams now to join in the fun. Ring us toll free at 1-800-346-6116, or email Tina@islandream.com. We look forward to the pleasure of serving you.